Soria is nestled in the heart of some outstanding areas of beauty which include the Canon del Rio Lobos Nature Reserve, the Sierra de Urbion Mountains, and Laguna Negra Lake. Therefore if you enjoy outdoor activities there are certainly plenty at your disposal, such as hiking, climbing and canoeing as well as downhill and cross country skiing during the winter months. 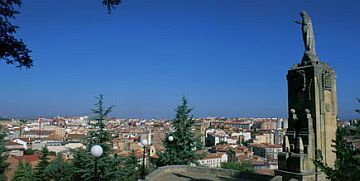 Soria is actually the capital of the province of Soria, and is located in the northern region of Castile. It was originally inhabited by the Iberians who later merged with the Celts in 400BC. When the Romans marched in and conquered Iberia Soria found itself surrounded and in order to escape slavery they committed mass suicide. Not long afterwards the Arabs conquered Soria and it was during this period the town began to prosper again. However, several centuries later it was captured by the French in 1808 during the War of Spanish Succession in 1808 and the troops set it on fire for siding with King Philip V. So Soria has certainly suffered a rather dramatic history through the ages. Today it is known for its famous wines which are produced from the Ribera del Duero label and its rich architectural heritage. One of its finest monuments is the San Juan de Duero Monastery which is a wonderful example of Romanesque design. The monastery was owned by the Order of the Hospitalarious Society of Jerusalem until it was eventually abandoned in the 18th century. Only the church and cloister remain, showing the changes in style from Romanesque to Gothic, as well as features which were influenced by the Moors. There is a beautiful walk from the monastery that follows the Duero River and leads to the hermitage of San Saturio. This was the same route the Spanish poet, Antonio Machado, used to walk when he wanted to meditate. 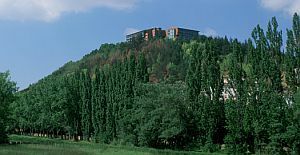 The Parador Soria (Hotel Antonio Machado) was named after this famous poet, and sits on a hillside overlooking the town. It is a modern four star hotel which has been extensively restored and has a very warm and welcoming atmosphere. Many of the rooms have marvellous views of the valley below, and there is also an excellent restaurant specialising in local cuisine. A rather impressive addition to the hotel is a fascinating collection of 14th century artwork. Another interesting attraction in Soria is the Gormaz Castle. The fortress was built by the Moors in the 10th century to protect the town from attack by the Christians who were trying to re-capture it. It is divided into two parts by a moat. The fortress area had seven towers which included the Keep and the Almanzor, and the walled enclosure was where the soldiers used to stay. Underneath the fortress there is also an underground reservoir and armoury. Summer time is a particularly popular time to come as tourists flock to see the famous fire walking rituals that are part of the Festival of San Juan in June. Soria’s fire walking receives a massive amount of media interest around the world. If you want to explore beyond Soria just north of it is the fortified town of Numancia. The town became rather famous for its heroic effort to resist capture by the Romans, although it did eventually fall in 133BC. Or for something a bit more fun for the whole family, particularly if you have an interest in dinosaurs, you must visit the district of Tierras Altas de Sori. Here you will find a number of Ichnite Routes which are trails left by the dinosaurs 150 million years ago. There are three main routes, one of which you have to explore on foot, and the other two can be explored by car. The route on foot starts from the Palaeontology Centre in Villar del Rio and includes two sites that have ichnites. One left by Theropods and the other by prehistoric birds. The Palaeontology Centre itself is great fun for the whole family as there is a life size dinosaur nest and a site where the children can dig for dinosaur eggs! The East and West routes also begin (or end depending which direction you start from) in Villar de Rio. On the East Route you will pass through Valdelavilla where you can visit the Valles de Valdelalosa which has marvellous fossils of flying reptiles as well as beautiful views of the summit of Moncayo. If you travel another 4km you will come to the town of Matasejun which also has spectacular scenery. This is where the Las Adoberas site is located. Continuing along the East Route you will come to the San Roque site in Ventosa de San Pedro which has a life size replica of an Iguanodon, and only another 15km away is the Fuentesalvo site with trails made by several dinosaur groups. The West Route starts at Salgar de Sillas with six ichnite trails left by a Sauropod. The Los Tormos site is 15km from Salgar de Sillas, and this site has a replica of a Rhamphorhychus. Then you come to the Santa Cruz de Yanguas site where there is a replica of a Stegosaurus. If you travel another 6km you will eventually come to Bretun where the Lacorte-El Frontal Fountain site is located and has a spectacular replica of an Allosaurus. There are in fact two other sites in Bretun. The La Matecasa which has a replica of a Triceratops, and La Pena that has a trail made by a Theropod. Any one of these routes will make an interesting day out but combined with the stunning scenery and outdoor activities available, Soria can offer you a very interesting time.